As we come to the end of the anniversaries for the execution dates in 1916, I have to stop and ponder the logic of the British government throughout history. The Rising was not popular and it was rife with miscommunication and leadership wars. If the government had not executed the leaders, making them martyrs, it may have been a footnote in history. They have made this mistake time and time again, almost as if they either WANT to concede their empire or as if they want the struggle to continue. Whenever the people get sick of the fighting and membership of Republican fighters is down, they do something so wrong and so tyrannical that suddenly, there’s a giant surge in the ranks. This happened in 1916. It happened in Derry when the Army shot 26 peaceful protesters. It happened again when Bobby Sands and the other hunger strikers lost their fight and died in prison. Depending on how the dust settles, it may happen again in the aftermath of Gerry Adam’s arrest just weeks before elections. You would think that SOMEONE over the puddle would be more strategic and learn from their historical mistakes. One of their biggest mistakes, was letting Grace Gifford and Joseph Plunkett get married the night before they executed him in 1916 at Kilmainham. It is a tragic love story of star crossed lovers – one that tugs on the heartstrings of anyone and everyone, even those who didn’t approve of the Rising. They were married in the prison chapel and were only allowed ten minutes of supervised time as husband and wife before the crown shot Joseph Plunkett the morning after the wedding. They were taunted and watched for the entire 10 minutes and yet, by all accounts, they only had eyes and ears for each other. 10 minutes of bittersweet joy before their love was destroyed – and as Shakespeare can attest to – that makes for an undying, sympathetic story that the whole world can stand behind, rebel or not. Grace was a strong woman. She was the daughter of a mixed marriage (Catholic and Protestant) and was an unlikely rebel. She tried to make a living as an illustrator and a political cartoonist. She was to be married to Joseph Plunkett on Easter Sunday – plans that were made before she had any knowledge of the Rising. She insisted on the wedding in the prison chapel when she learned that her fiance was to be executed on May 4th, 1916. On May 3rd, she bought her own wedding ring and went to the jail to marry her love, despite her parents’ objections, knowing that she was to be a widow just hours later. She never remarried and remained Grace Gifford Plunkett for the rest of her days – a shining example of a dedicated Republican woman and a walking reminder of her tragic love story. 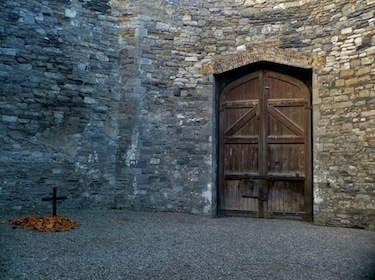 She was known as Ireland’s tragic bride and she returned to Kilmainham Gaol as a prisoner years later. Plunkett was a poet and a signatory on the Proclamation of Independence. Already a romantic and philosophical man, his wedding to Grace and their story of tragedy and dedication made their love a flash point of the rising that continued to burn after he was executed. Their 98th anniversary was just days ago. Kilmainham has reopened as a museum and a tourist location. One of the first places you will visit there is the prison chapel where they were married. A projector displays their photos above the altar at the start of the tour and you will also see both of their cells while visiting. Hers still has one of her more famous paintings on the back wall – one of Mary, showing that her adoption of Joseph’s Catholic faith stuck even after her husband was killed. On the 3rd floor of the Gaol is an unnerving and heartbreaking exhibition of ‘Last Words’ – featuring the letters, mementos, and other possessions of Republican prisoners and rebel leaders. The letters from the prison to Grace are almost as gut-wrenching as the correspondence between her and her future husband in the days leading up to their wedding and his death. It is impossible to stand in the room without feeling the power of their story and the shadow of their love that remains. It was also impossible for me to be there without tears streaming down my face for almost the entire tour. So happy anniversary to Grace and Joseph. If there’s any justice in the world, they found each other again in their version of the afterlife and maybe someday soon, the free Ireland they both believed in will finally come to fruition. This entry was posted in Death, Ireland, Love, Politics, Uncategorized and tagged 1916, Easter Rising, Eire, execution, Grace Gifford, Grace Gifford Plunkett, history, IRA, IRB, Irish history, Irish Proclamation, Joseph Mary Plunkett, Joseph Plunkett, Kilmainham Gaol, Plunkett, Poet, Politics.